Or how to talk your way out of it. The CEO of our company was named Eddie. It’s an appropriate name and he would’ve sold it to you given half a chance. Hell he’d sell you your own name if it were legal. Eddie once sold an entire range of Mining Wear to a prominent minerals company. He came into the office the morning after and casually checked with me. Despite his virulent sales prowess, nothing got Eddie’s adrenaline pumping like talking airline staff out of the excess baggage charge. In the old days (pre GFC fuel tax hike) it wasn’t too tricky. We’d turn up with at the airport with enough crew, the weight would distribute fairly evenly and if it was a bit over they’d let it slide. The last couple of years however, the challenge has increased, and the technique refined. It begins in the line, sussing out which counter to go for – it’s a good idea to look for a self assured posture, a broad smile and evidence of genuine compassion – like removing prior travel tags from the bags so the passenger doesn’t have to do it. When you get to the front of the line you may need to stall until the right counter is free – this is easy – fussing with luggage, searching for tickets or just acting vague all work well. When you get called, stride over with confidence, wheeling your cargo with ease, as though it’s the lightest freight in the world (nothing looks worse than a five person crew wheezing and straining and making multiple trips with a stack of metal boxes). This must be backed up by a full team effort. Dwayne and I would be passing bags relay style onto the weigh station, helpfully removing old tags and double checking everything with the staff member, letting them know they’re boss. Our production manager Daphne would have all tickets and ID cards at the ready and her own pen to sign the fragile items waivers. If the conversation looks like it might be heading into dangerous territory (“Wow, lot of gear guys!”) then go for a direct disarmament. This is the full hand – if you play these cards and they don’t fold you’re in trouble. Nine times out of ten though, you’re home sailing. The only time talking holds less sway is in foreign countries. Coming back from a shoot once in Japan we encountered a check in attended who had very limited English (though not as limited as our Japanese). He was charging excess based only on the number of bags instead of weight, so we tried improvising. Pointing at random bags we took turns counting out loud: “One, two, three, four, five, six, seven and these two. Seven.” Confused he would start the recount and we’d helpfully jump in: “…five, six seven and these two. Seven.” After twenty minutes he was so distressed he apologised profusely for the confusion and sent us through. Amazingly this trick works in America as well – without the apology of course. 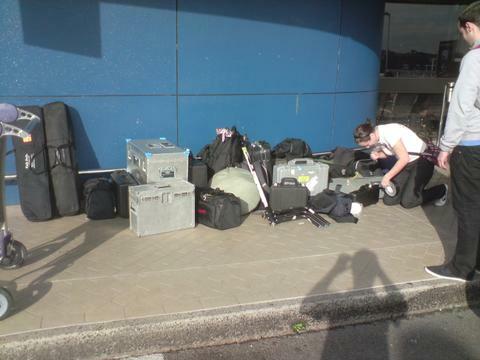 No matter where you are or what you’re doing, nothing kicks off a good shoot better than a hefty excess baggage evasion! 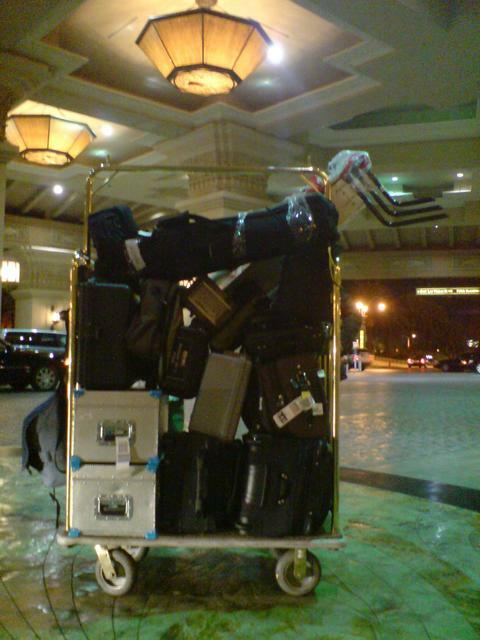 Checking into a hotel in Vegas. You're heading in the right direction, Mr. Director! The only thing your blog lacks Leslie, is commitment. Encore!! my first comment was before reading ... Now i realise how funny is the mess in my chaid ( drums , tent , posters , cd , ...) ; next year i'll bring you back the airport and you'll show me ! Really a confusing way of demonstration, but techniques is working to get something.